As I stated in my preview article on Saturday, the Buffalo Bills need to play just about a perfect game in order to win, especially when they are playing on the road. That wasn’t the case Sunday at Houston, as the Bills lost their fourth game by a score of 20-13 to the Houston Texans. Any time the defense records seven sacks and forces three turnovers, the team should win but huge mistakes by the special teams and the offense cost the Bills a chance at a victory. The first big mistake was when Ray-Ray McCloud muffed a punt giving the Texans excellent field position and setting up their first touchdown. Later the Bills got caught for holding on a long punt forcing them to re-kick. The second punt wasn’t nearly as good and there was a noticeable change in field position. The Bills also had a punt blocked which gave Houston great field position. The offense twice got called for an illegal formation and on both plays it cost the Bills long gains. One was a deep throw to Kelvin Benjamin and the other was an 11 yard completion to Zay Jones. There is no excuse for illegal formation penalties as it’s just a matter of lining up correctly. It’s mental discipline or lack thereof. 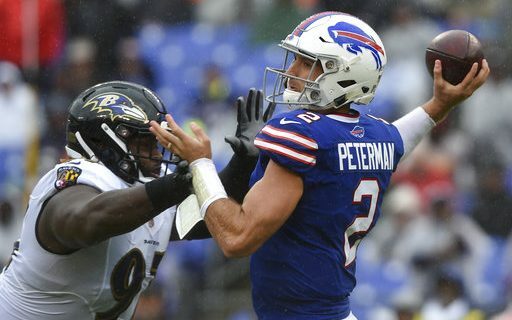 Nathan Peterman, who replaced Josh Allen after Allen injured his elbow, also threw an interception that was returned for the Texans winning touchdown. The Bills can’t have plays like that and expect to win. Another disturbing item is Josh Allen is still processing slowly and holding onto the football far to long. Sunday he got sacked twice and pressured numerous times. On the pressures he almost never recovers to make a positive throw. Granted, defensive coordinators will try to confuse Allen with defensive alignments and different blitzes, but now after four starts he has to see things more quickly and get the ball out of his hand. Allen flashes enough to let us know that there is a light at the end of the tunnel, but it’s frustrating to watch. Having a sub-par offensive line and wide receiver corps doesn’t help matters. The line does a below average job with pass protection and the receivers struggle to get open and gain separation. In order to prevent consistent pass rush pressure the Bills need to have a strong ground game and they have been unable to have that so far this season. The run game has to keep the Bills offense on schedule, too many third and six or longer situations plays right into the hands of opposing defenses. Next up for the Bills is a road game against another struggling team the Indianapolis Colts. If you remember last year, these two teams met at New Era Field in a blinding snow storm and the Bills were able to prevail. This year, the Colts have quarterback Andrew Luck back and while he isn’t the Luck of old, he can still be dangerous.